Truckee, CA…On May 28th and 9:45pm CHP Dispatch received a 911 call from a person stating they were involved in a hit and run collision. 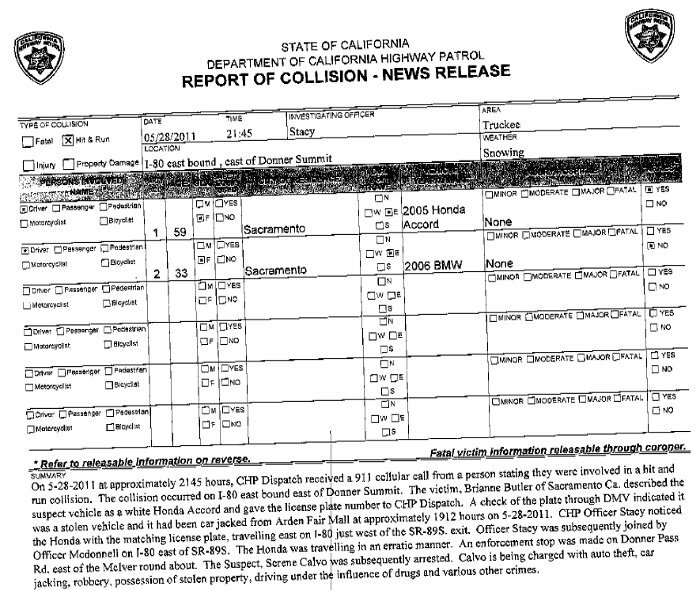 The collision occurred on I-80 eastbound east of Donner Summit. The victim, Brianne Butler of Sacramento described the suspect vehicle as a white Honda Accord and gave the license plate number to CHP Dispatch. A check of the plate indicated it was a stolen vehicle and it had ben carjacked from the Arden Fair Mall a couple of hours earlier. CHP Officer Stacy noticed the Honda with the matching plate, traveling east on I-80 just west of the SR-89s exit. Officer Stacy subsequently joined by Officer Mcdonnell on I-80 near SR-89s. The Honda was traveling in an erratic manner. An enforcement stop was made on Donner Pass Road east of the round about. Suspect Serene Calvo was subsequently arrested. Calvo is being charged with auto theft, car jacking, robbery, possession of stolen property, driving under the influence of drugs and other crimes..